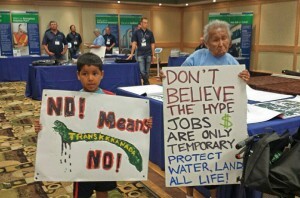 This time, the people weren’t interested in hearing TransCanada’s “information session” pitch. The tradeshow set-up had booths, corporate fact-sheets, and enough staff for one-on-one interactions to keep concerned citizens unaware of each other’s objections to the proposed Energy East pipeline. Many in attendance had already made up their minds against the Energy East project proposal to convert the 50+ year-old natural gas carrying “Canadian Mainline,” and build new pipeline sections, into what could be North America’s largest tarsands pipeline, with 1.1 million barrels of diluted bitumen per-day from Hardisty, AB to marine terminals at Saint John, NB for international export. Kenora Transition Initiative, 350.org, and Kenora community members began with a picket across the street from the Inn, with signs and leaflets to counter TransCanada’s. But, after two patient hours outside the hotel, Anishinaabeg led the walk inside with song and did not allow TransCanada reps and contracted Garda security to take their signs away. “I’m here to speak for my children and my grandchildren and there’s not going to be any oil going through this land, even when I die my kids are going to stand up after me, and that’s it, no pipelines,” first announced Shawanoong Noodin Ikwe (Chrissy Swain) of Grassy Narrows to the captive audience of TransCanada staff. “What do you project for the future? In 50 years, 25 years, 100 years, what is going to happen to the pipe? It’s going to corrode…It doesn’t matter what you say, there is going to be leaks in there…. 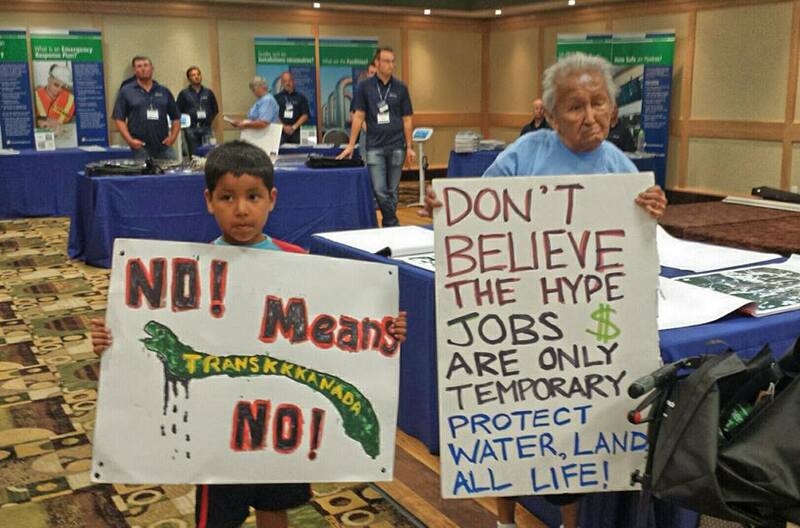 What is going to happen to our water…our children are not going to be able to drink it,” said elder Nancy Morrison, 85, originally from Onigaming who challenged TransCanada’s “Gary” with the people standing behind her. Seenie who vocally shut-down Phil Fontaine’s speech at the University of Winnipeg in Janurary vowed to keep speaking out and put her life on the line in order to stop the project. Fontaine’s consulting group Ishkonigan is contracted by TransCanada to engage with 185 first nations communities along proposed corridor. TransCanada expects to file it’s regulatory application to the National Energy Board this September before it can be approved. The company aims to have the pipeline pushing diluted bitumen by 2018.